We received the sad news, from his daughter Diana, via John Cripps, that Alex died peacefully, at home in York, on 18 December 2018. Alex joined HMSO in January 1951 as a Technical Clerk in Printing and Binding. He retired as Director General, alongside Ken Allen working to Controller WJ Sharp. Tributes have been received from several old friends and colleagues, including Gerry Aldus, Paul Barnard, Gordon Parfitt and Roy Plackett. John Eveson adds: Sad news indeed. A respected and thoroughly nice man. Les Birch adds: Very sad news indeed – Alec was a lovely chap, always so friendly and helpful and we got on together extremely well. Very sad too about dear Arthur Brunwin, another lovely man and another good friend. What an end to the year but I send to you and all other surviving oldies my very best wishes for a better 2019. Yours, Les. Don Ray adds: Thank you Reg. I had received the usual Christmas Card from Alex and Mae so was surprised to receive a letter from their daughter Diane with the sad news. 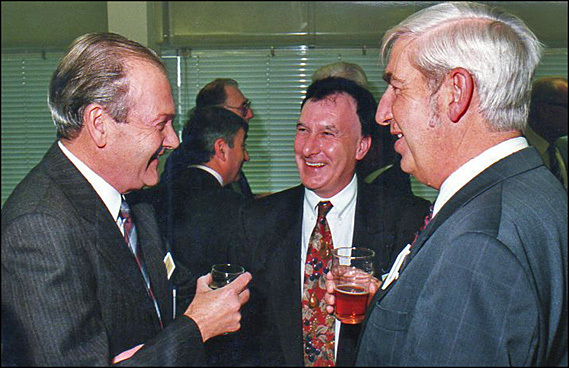 Alex and I worked closely together when he was DPP and I DS and got on very well but Les does say it all really – he was a lovely man. In case you are unaware and if anyone is interested Diane says he and Mae have been supported by Age UK and they are having a collection for them. Donations to The Cooperative Funeral Care, 53 Gale Lane, Acomb, York, YO24 3AD. Best of wishes for 2019, Don. Tony Smith adds: A particularly sad message at this time but, in particular, because of the many times that Alex and I confused people over the years by both being A A Smith!!! It only came to my attention when, having just arrived in Edinburgh as a young EO in charge of the Supplies business at the Sighthill office, I started to receive phone calls for Alex who was at the Edinburgh Press on the other side of the city – in Annandale Street (I think) – and the phones were not linked so the irate callers had to redial another number. Later, in Atlantic House, I won the SO Review crossword competition and received the 10 shillings and six pence prize money but Alex, on seeing that A A Smith had won, brought all his staff tea and cakes and then waited for the prize money to arrive – which, of course, it never did! When I was getting married and applied for a week’s marriage leave, Alex received a letter granting him a week off to get married – though he was, of course, already married! When Alex was moving from London to Norwich I received a cheque for £1000 to cover removals – which, of course, should have gone to Alex. And so it went on . . .